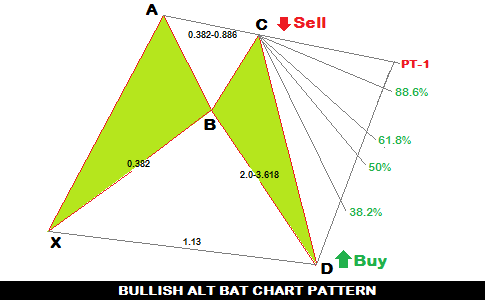 Bullish ALT bat harmonic chart pattern confirms a buy entry upon the completion of the pattern. It is an XABCD chart pattern. This post is aimed to explain the way to draw a Bullish ALT harmonic chart pattern and the way to apply the pattern in forex trading. How to draw a Bullish ALT Bat harmonic chart pattern ? To draw a bullish ALT bat harmonic chart pattern, first of all we have to find the X and A points at the bottom and top of a bullish trend respectively. 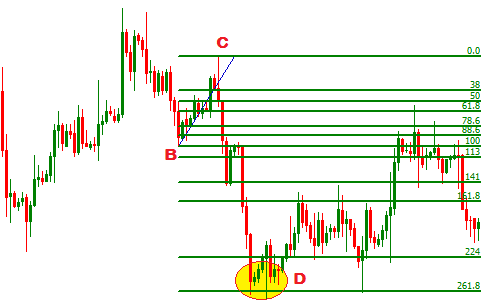 In the second step, a Fibonacci retracement tool is drawn starting from the point X and ending at the point A. This tool is drawn to confirm the point B of the bullish ALT bat harmonic chart pattern. The point B should be at the 38.2% Fibonacci retracement level. In other words, AB/XA should be equal to 0.382 Fibonacci ratio. In the image below the second step is illustrated, where you can see the point B is not hundred percent accurately confirmed but still can be accepted. 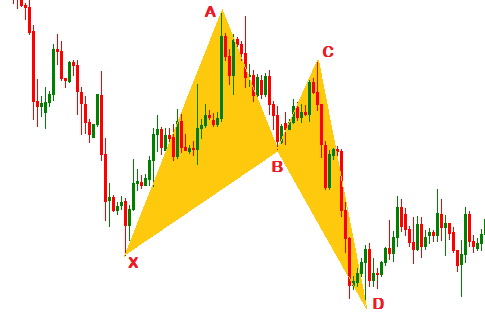 In the third step, the point C of the bullish ALT bat harmonic pattern is to be confirmed. A Fibonacci retracement tool is drawn starting from point A and ending at the point C. The point C should be at the 38.2-88.6% Fibonacci retracement level. In other words, BC/AB should be equal to 0.382-0.886 Fibonacci ratio. The third step is illustrated in the image below. In the fourth step, a Fibonacci retracement tool is drawn starting from point B and ending at point C to confirm the point D of the bullish ALT bat harmonic chart pattern. Here in this case the point D should be at the 200-361.8% Fibonacci retracement level. In other words the ratio CD/BC should be between 2.00-3.618. In the image below, the fourth step is illustrated. In fifth step, the point D of the bullish ALT chart pattern is reconfirmed. 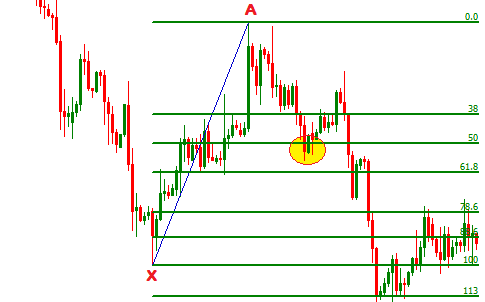 To do it, a Fibonacci retracement tool is drawn starting from point X and ending at point A. The retracement at point D should be 113%. In other words, the ratio AD/XA should be equal to 1.13. The fifth step is illustrated in the image below. In the final step, the XA, AB, BC, CD, BD, XB straight lines are drawn to find the pattern. Actually, in price chart traders just need to confirm the points, no pattern are required to be drawn geometrically as shown in the image below. How to apply a Bullish ALT Bat harmonic chart pattern? To explain the technique of trading with bullish ALT bat chart pattern, I will refer you back to the image at the top of the post. Usually, a buy order is suggested when the D point of the pattern is confirmed. But smart traders place buy orders at point B and sell order at point C also. This is possible if you have long trading experience with harmonic chart patterns. The take profit for the buy order placed at point B should be at the point C. Stop loss for the buy order at point B should be placed at the next grater Fibonacci retracement level. 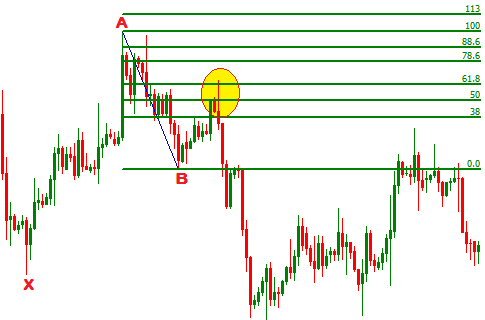 The take profit for the for the sell order placed at point C should be placed at point D. The stop loss for the order should be placed at the price level at point A or the next grater Fibonacci retracement level. Most reliable order with bullish ALT bat harmonic pattern is a buy order when the point D is confirmed. 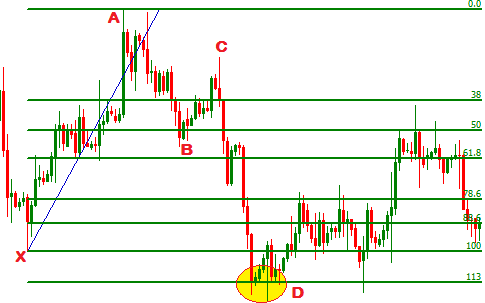 The take profit for the order can be placed at different retracement levels. If the currency pair has strong bull power, the profit target can be placed at the AC trend line. If you have any question regarding the bullish ALT bat harmonic chart pattern, you can drop a comment below.You can enter your email address in the subscription box to receive the updates. but on the 44th picture you use 261.8 ratio ? Dear Alex, Thank you for visiting my blog !!! I get your question !!! In first picture I said that the D point should be at the (2-3.618) Fibonacci retracement. (2-3.618) is the range to confirm the point D. In the 4th picture the point D is at the 2.618 Fibonacci retracement level, which is within the range (2-3.618). Additionally, if the BC move is relatively big, 2.618 Fibonacci retracement commonly confirm point D, If the BC move is relatively small, larger Fibonacci retracement is required to confirm point D.
If you have any more question, you can drop it below. I will response you ASAP. what is the target of point D ?